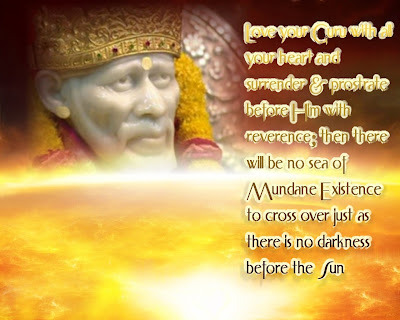 Guru poornima is a major festival celebrated in the sacred land Shirdi. The other two festivals that are celebrated in the divinely vibrant Shirdi are Ramanavami and Dassera. This year 2009 the Guru poornima is on date 7th July, 2009. Also Lunar eclipse will happen on this day, which will not be visible in India or in Shirdi. Dasera is an auspicious day celebrated by Hindus. The reason of celebration of Dassera, in the abode of Sai Baba's physical presence (Shirdi) is because Baba left the physical body on that day (Mahasamadhi). It was indeed a very sad and shocking day for all the Shri Sai devotees who loved and worshiped Baba. For them the loss seemed to be immense. As Sai Baba was not, a Saint or God for them who had tremendous miraculous powers which helped many devotees in times of distress. Sai Baba of Shirdi was not just a spiritual Guru who helped them and guided them to spirituality and also in temporal matters. With all of above Baba was a very gentle and loving form. Who talked with the devotees and joked with them. He told stories and parables. He played with the children. Baba was also like a family member to them, a family member that was love incarnate. Just a glance on Shri Sai would make them feel calm serene and lovingly taken care of. They were sure that Sai Baba's tremendous love was with them. They need not fear as Sai Baba was there to stop them from doing any wrong which could hurt them. Sai Baba was there to save them from the most difficult situations they might be facing or that might be on the way in near future. A family member who always took care of them and saved them from many calamities, even when they were far away from His physical presance. Many such experieances later were jotted down as miracles of Sai Baba. They were not miracles in the true sense. They were the love and care for the devotees. The miracles happened not for the sake of miracles but out of love and care for the devotees. The miracles that happened were there, to let the devotees know that He was with them where ever they were and His graceful and loving Nazar was always with them. To let them know that He was not confined with physical limitations as most of us humans are. Just as we humans use the subtle waves, that modern technology has discovered, to stay in touch with our friedns and families through gadgets like mobile phones, internet, and to stay in touch with events through satelite telivison channels. Sai Baba remained and remains in touch with His devotees through His divine powers taking care in every possible way. According to both Hindu and Buddhist traditions, Guru Puja Day or Guru Poornima Day is celebrated on the Full Moon day of the Lunar month Ashadha, which corresponds to June-July of the Roman Calendar. Many Hindu festivals or based on the Lunar calendar. The size of the moon has tremendous effects on our body and minds. Our bodies contains about 75% of water by weight. Moon affects the water of ocean we can see that in the tidal changes that takes place according to the size of moon. So full moon of Gurupurnima day is very special for Guru puja (worship) of Spiritual Guru or being available to Guru's grace. singing or listening to Sai Baba's Bhajans. Gurupoornima is celebrated in Shirdi since Sai Baba was in His physical forms. It continues. These days on Guru poornima days Shirdi is suffocated with huge number of devotees who wish to spend this auspicious day in their beloved land Shirdi. Shri Saibab Sansthan Shirdi arranges for many devotional events on this day. Also along with all this events many things have to be take care of since the numbers of devotees visiting Shirdi on Gurupoornima day reaches in lakhs. This does not stops the devotees who are called by Baba's grace on this special day. Other devotees spend there time where ever they are in any form of devotion of Sai Baba stated above. Not only in Shirdi, the festival of Gurupoornima is celebrated with much devotion and spiritual events all over world in local temples of Shirdi Sai's temples and also at homes of devotees, on whom Sai Baba's love is experienced. Sadguru Sai Naath Maharaj Ki Jai. Om Sai, Om Sai, Om Sai. Sadchit Anand Sai ko koti koti pranam. "Guru is creator Brahma; Guru is presever Vishnu;Guru is also the destrover Siva and he is the source of the absolute.I offer all my salutations to the Guru"
Yes you can always add the link of this site to your blog. I truly believe in Sai Baba, i visited shirdi few months ago for the first time and i just can't tell you how blissful was the experience for me. I never found myself so much calm before visiting there. i am muslim but i have also believe in sai baba. I had done saptha prayan many times for same wish n I saw many times baba in my dreams but my wish is not completing I want to marry a person but now because of family pressure he engaged with someone else now he is also not happy what should I do now pls suggest me? ?